In 2006 Colleen Skidmore, Alberta writer, scholar and researcher, edited This Wild Spirit: Women in the Rocky Mountains of Canada, a marvellous compendium of writings and images by and of women from the late 19th to mid-20th century. Adventurer Mary Schäffer provided nine of the entries (among 48 by more than two dozen women) and the majority of the photos. 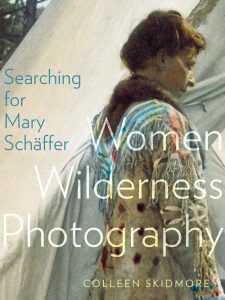 Skidmore has followed up a decade later with Searching for Mary Schäffer: Women Wilderness Photography, a handsome, elegantly designed and produced book that draws from rich archival material. Though sometimes academic in tone, it’s a full and fascinating narrative of Schäffer’s adult life, including her four-month summer excursions, in 1907 and 1908, into remote areas of the Rockies of Alberta and BC. The story extends to Schäffer’s autumn 1908 visit to Japan. Schäffer, an educated, privileged woman from Philadelphia, began visiting the Rockies in 1889, first travelling with her husband, Charles, and then—after his death—with other companions. Her initial trips served as enticements for deeper journeys, “to penetrate to the headwaters of the Saskatchewan and Athabasca rivers… to delve into the heart of an untouched land.” Heading out from Banff in 1907 along with Mary (Molly) Adams and accompanied by guides, Schäffer explored, photographed and documented what they found. A skilled writer, botanical painter, photographer and mapmaker, she created a record with pen, brush and lens of hard but heady days riding horseback and absorbing the spectacle of turquoise lakes, rugged peaks and delicate flora. Schäffer and Adams were the first non-Indigenous women to explore this backcountry. The narrative is supported by 82 photographic plates—39 of them in colour—which capture Mary and Molly at campsites in the dramatic terrain; local Indigenous citizens sitting for family portraits; and Schäffer’s stunning watercolour paintings of the delicate alpine flora. She hand-coloured some of the slide images and several of them are shown. Schäffer and Adams sometimes refer to Indigenous people as “squaw” and “savage” in reductive, naïve language acceptable at a time of, as Skidmore astutely notes, “overt racism and the crescendo of imperialism.” However, Schäffer also reports on the politeness and humanity of the Indigenous people she met. 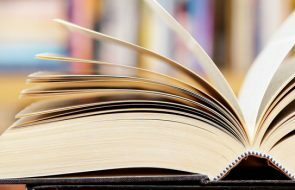 In this detailed book, Skidmore writes Schäffer, deservedly, into a historical narrative heretofore populated mostly by men. For this, and for its rich glimpse into a liminal time, an historic moment prefacing “unprecedented human intervention and intrusion into this place,” it is a significant achievement. —Steven Ross Smith is a poet, journalist and editor in Banff.